A family of four have met a cruel fate after they all died in a fatal plane crash on Sunday. A small plane has crashed in southern Wisconsin, killing four people — a 17-year-old girl, a 13-year-old boy and their mother and grandmother. The Green County Sheriff’s Office says the crash happened just after noon on Sunday about a mile north of the Monroe Municipal Airport. Sheriff Mark Rohloff says the single-engine Cessna 182T went down in a grassy meadow. 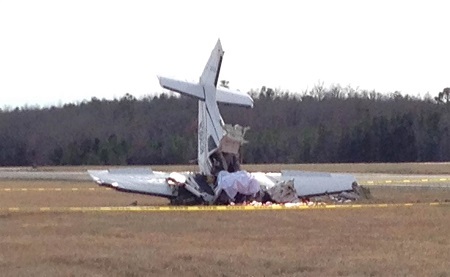 Rohloff says the plane was within sight of the airport’s runway when it crashed. He says the pilot and three passengers died at the scene. They were related — flying to Monroe for a family event. The grandmother had previous experience landing at the airport and the family had been tracking their flight and contacted the sheriff’s office when they lost contact, Rohloff said at a news conference. The plane had taken off from Kenosha, Rohloff said. Multiple people called the sheriff’s office around noon Sunday to report seeing a plane in the sky lose altitude and crash, according to the release. Rohloff said authorities are assuming there were mechanical problems with the plane before the crash. The crash is under investigation by the sheriff’s office, Federal Aviation Administration and the National Transportation Safety Board. The final outcome from the investigation may take more than a month. Rohloff said during the news conference that there was a large amount of debris at the scene.